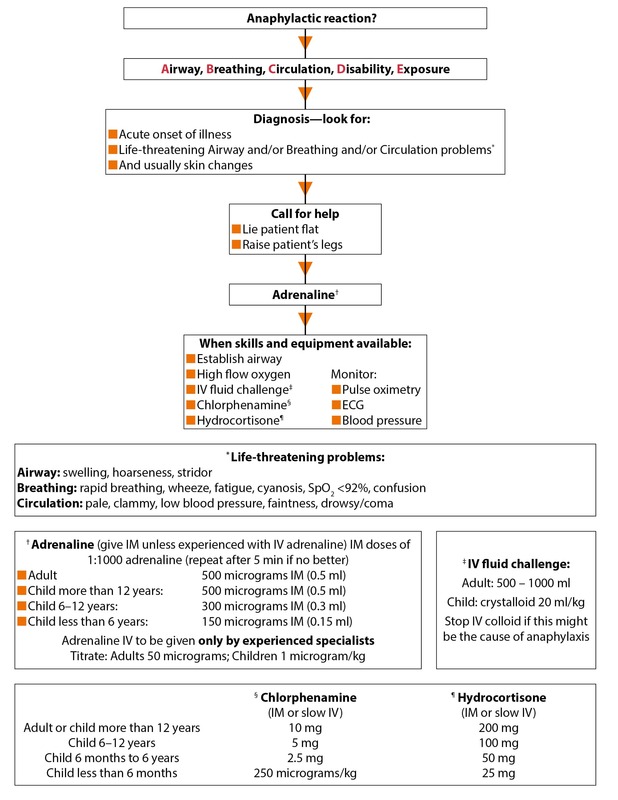 when to refer patients with allergic-type reactions to specialist services. The problem is compounded by inaccurate or incomplete documentation that does not record the severity of the reaction nor distinguish between true drug allergy and other adverse reactions.7,12,13 The NICE Quality Standard 97 on drug allergy, published in July 2015, outlines measures to help counter these problems and improve the future diagnosis and management of drug allergy.14 It forms the basis for the remainder of this article. People with suspected drug allergy have their drug reaction documented using the structured assessment guide. People with a new diagnosis of drug allergy are advised to carry structured information about their drug reaction at all times. People with a suspected or confirmed anaphylactic reaction, or severe non immediate cutaneous reaction to a drug, or reaction to a general anaesthetic are referred to a specialist drug allergy service. People with drug allergy have their status documented in their electronic medical record using the recommended coding framework. People with a new diagnosis of drug allergy who are being referred or discharged have their drug allergy status updated in all GP referral and hospital discharge letters. (developmental) People with a drug allergy have information included on their prescriptions about which drugs or drug classes to avoid. Developmental quality statements set out an emerging area of service delivery or technology currently found in a minority of providers and indicating outstanding performance. They will need specific, significant changes to be put in place, such as redesign of services or new equipment. red purpuric macules or erythema multiforme. which drugs or drug classes to avoid in future. Patients who display truly allergic reactions of any kind or those reacting to general anaesthetics, as well as some patients who react to local anaesthetics, NSAIDs or beta-lactam antibiotics should be referred to specialist allergy services14 (see Table 2,14 above and Box 2,1 below). they have had anaphylaxis or another suspected allergic reaction during or immediately after general anaesthesia. While history taking and examination aid the diagnosis and management of drug allergy, once the patient is stable a mast cell tryptase level can help inform a final diagnosis.16 A clotted sample should ideally be taken as soon after the reaction as feasible, and another a few hours later.19 The medical notes and pathology request forms should document how long after the reaction onset each sample was taken.16 The results of these tests should be sent with the referral to allergy services. 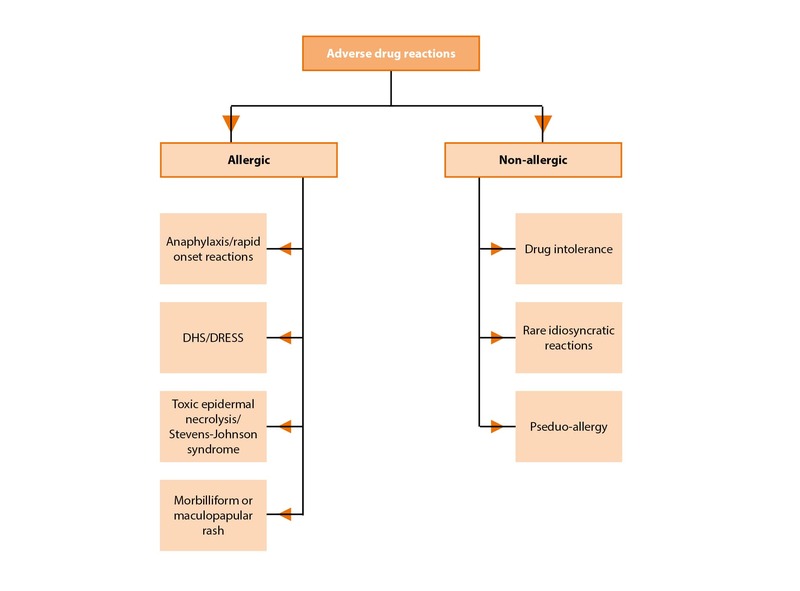 Once clearly categorised using the structured assessment guide (Table 2, above), drug reactions should be recorded in the electronic medical record using the recommended coding framework (see Box 3, below), which should clearly distinguish between allergic and non-allergic reactions. 'unable to ascertain' (document it as soon as the information is available). In addition to accurately coding the drug reaction into the patient’s electronic medical record and giving them a note to carry, healthcare professionals should ensure that the reaction is shown on all referral and discharge correspondence to and from hospital. Since some patients may not read or fully understand the information given to them, the names and classes of drugs that they should avoid should also be written on all prescriptions.14 This serves as important documentation, especially for pharmacy staff who may not always have access to referral or discharge letters. Computer systems that automatically update drug reactions with the desired level of detail into referral letters, discharge letters and prescriptions may be useful. A 'drug allergy box' is generally available on prescriptions issued in secondary care; however, the FP10 prescription issued in primary care does not provide any information on which drugs and drug classes the patient should avoid. In an attempt to standardise best practice, and reduce this inequality, developmental quality statement 6 was included. In practice, implementation should not be difficult as most FP10 prescriptions are issued by computer and a list of drugs to avoid could easily be auto-populated. This would enhance patient safety by providing an additional opportunity for the dispensing pharmacist to check the prescription. In the limited time that primary care professionals have to see their patients, accurately documenting, coding and informing the patient as well as updating correspondence can be challenging. Those working in trusts that employ different computer systems between primary and secondary care facilities and where access to pathology results is not shared may also find it difficult to effect multiple actions for each patient with a relevant drug allergy. Given that most primary care services care for a large number of patients and that a significant number of these will either develop or have a label of drug allergy,20,21 any audit assessing drug allergy management includes a large data set. In order to prevent the audit process from becoming unrealistically time consuming, searching through computerised records with multiple search queries and cross matching the results may be a useful approach. The obvious search queries include 'allergy', 'allergic reactions', 'anaphylaxis', 'reaction to general anaesthesia' or any of the other suspected drug allergies that should be referred to specialist allergy services. The NICE quality statements indicate other outcomes such as medication errors, adverse effects of polypharmacy (e.g. where multiple antibiotics are used instead of one to which the patient is erroneously considered allergic) and drug related mortality.14 Key points for audit can be found below. Drug allergy poses a risk to patient safety with evidence of a lack of documentation, patient information, and continuing errors in prescribing and dispensing. It is likely that improvements in documentation, communication of drug allergy status between health service providers, and patient information will improve outcomes. Much of this will need to be carried out in primary care through changes in computer software. NICE QS97 sets a benchmark for care, requiring drug reactions to be correctly categorised and clinical details recorded using a structured proforma.14 In order to reduce prescribing errors this information should be provided to each affected individual and communicated on every referral letter and hospital discharge summary. Confirmation or exclusion of drug allergy is provided by specialist drug allergy services for certain patients. All prescriptions should clearly indicate the drugs or drug classes that need to be avoided. Include drug reaction information on all prescriptions. Documentation of drug reactions, was the structured assessment guide used? Informing patients with a drug allergy diagnosis—is standardised information provided? Is the diagnosis recorded with detail in the electronic record? Is it coded correctly? Do referral and discharge letters include drug allergy information? Are all patients who need referral being referred? Are inappropriate patients being referred? In cases of suspected anaphylaxis, blood should be taken immediately for mast cell tryptase and then again a few hours later to help identify genuine anaphylaxis. This CPD activity consists of 5 multiple-choice questions (MCQs) designed to test your knowledge on food allergy and anaphylaxis in primary care—you will then be prompted to reflect on your learning. This CPD activity consists of 6 multiple-choice questions (MCQs) designed to test your knowledge on cow’s milk allergy in primary care—you will then be prompted to reflect on your learning.